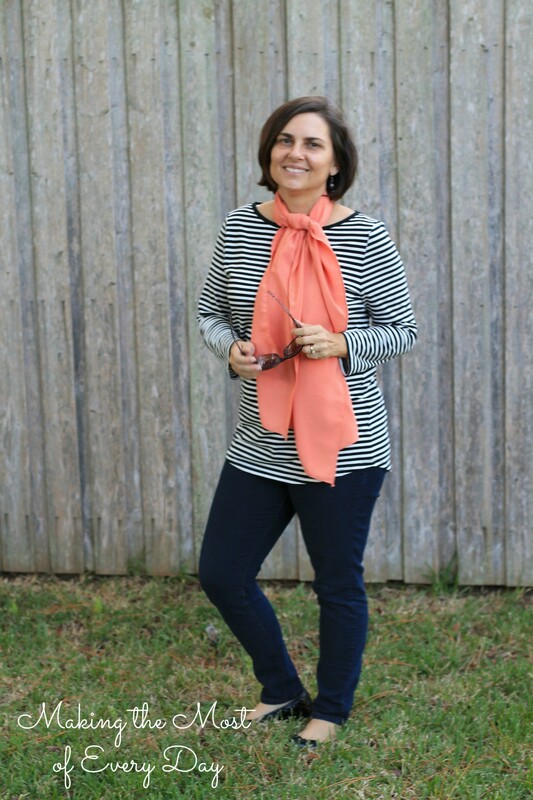 Continuing with the skinny jeans series, today I’m styling one of my go-to fall looks. Jeans and a tee shirt. It’s pretty easy to throw this outfit on and in a few minutes you are ready to go, yet you feel pulled together. 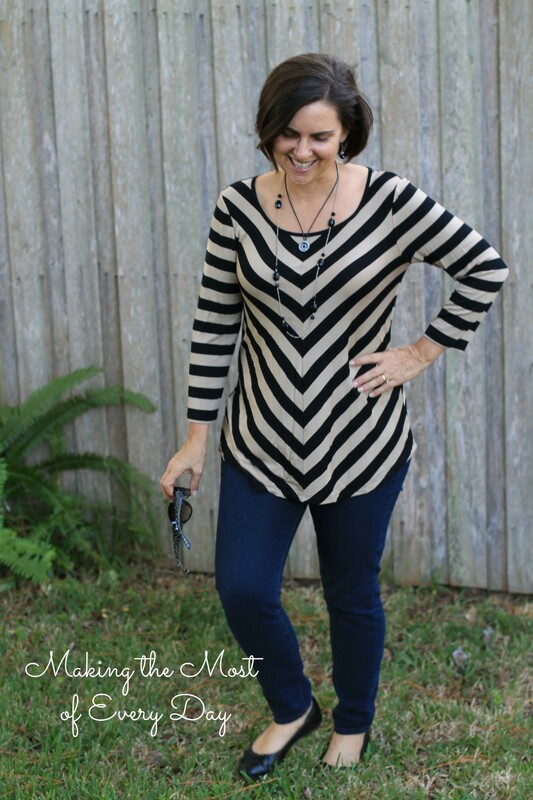 First up is the black and tan chevron striped top. I love the material. It’s so soft and drapey. I tried layering two necklaces with black in them to make them look like they go together. Next is a shorter sleeved swing top. I’ve worn this with skinny white jeans and leggings before. I did a little pattern mixing: stripes and this bandanna/paisley scarf. I’m not sure if I love it. Jury’s still out on that one. I didn’t get a good picture of this top. This is the best of all of them and since my photographer is off to soccer practice, it will have to do. Do you notice a pattern yet? No? Look closely. Maybe the next one will do it for you. 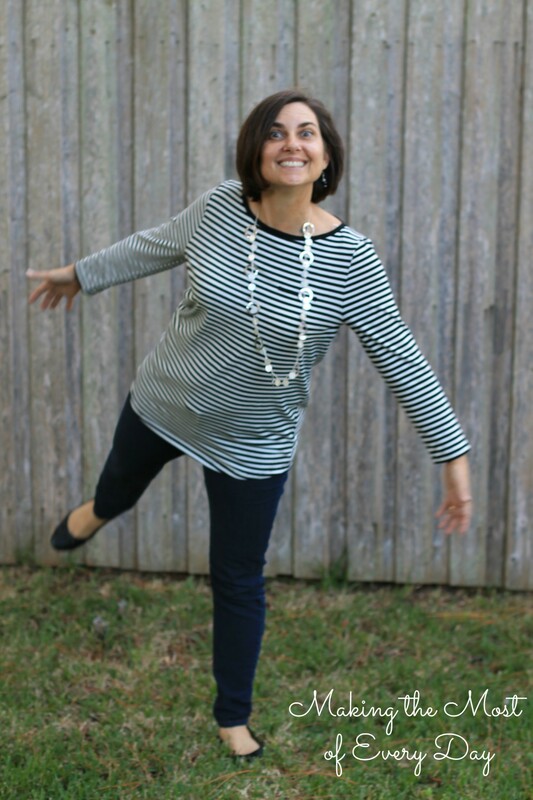 If you guessed, “My, that lady likes stripes!” you’d be right! I just bought this one off the clearance rack at Marshall’s. Can’t have too many striped shirts! 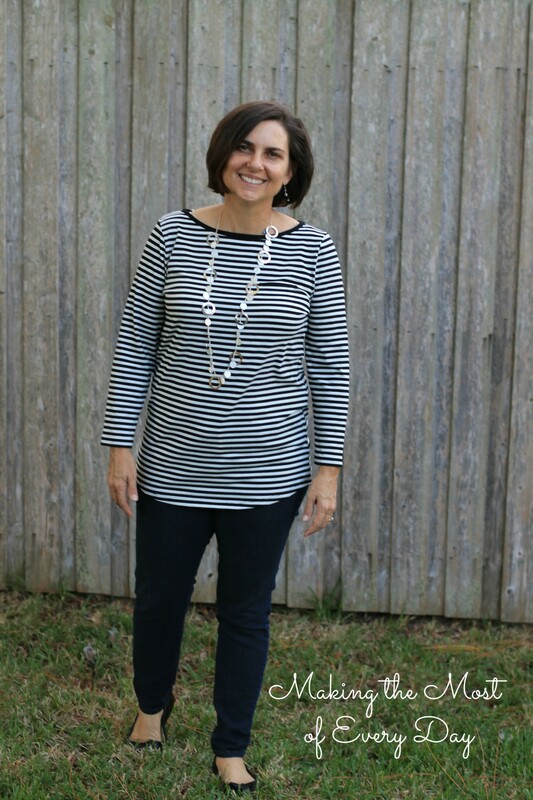 So the formula is skinny jeans + tunic top + 3rd element completer piece (like a long necklace or scarf) = easy comfort. If you are new around here, welcome! You can catch the previous 7 days on this page here. 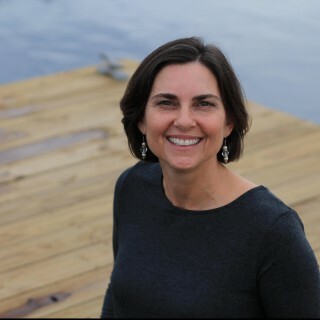 I’m participating in the Write 31 Days Challenge. 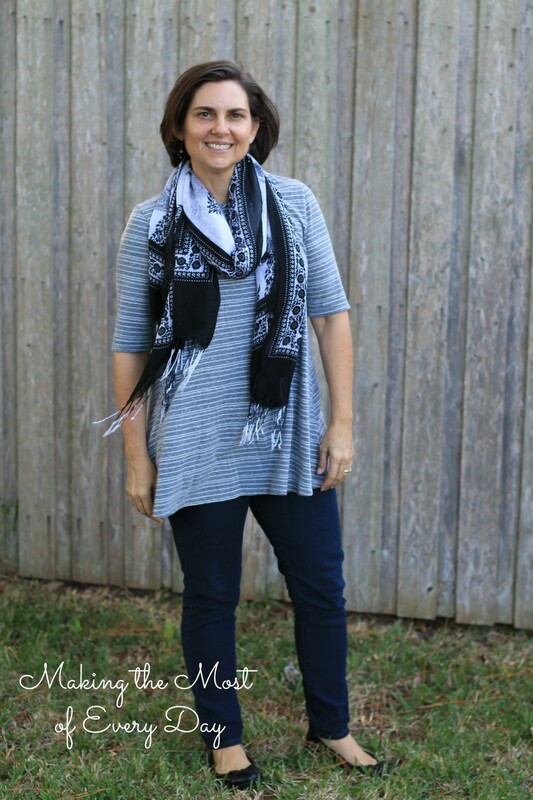 I like that patterned scarf with the stripes! 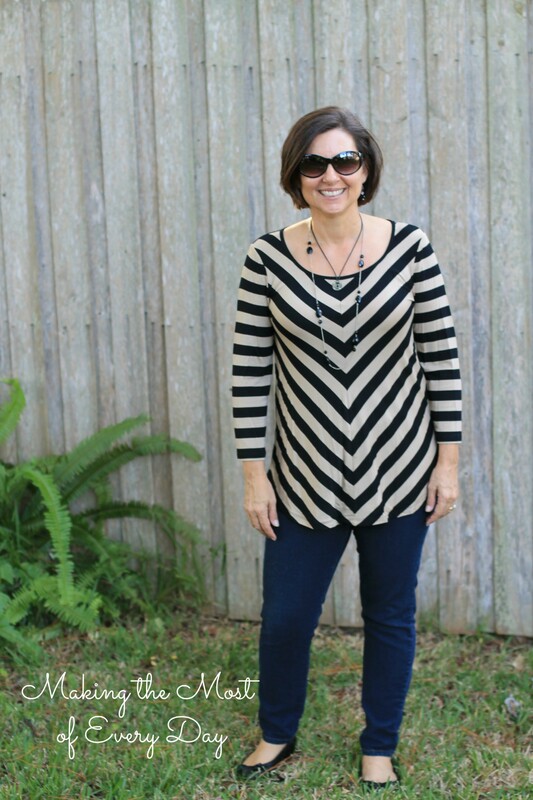 And the swing top style with the skinny jeans is a great look for you. I keep trying to remember that 3rd element. Last night just before we went out to dinner I thought about adding a necklace to my outfit. I couldn’t believe what a difference it made. Just that made my “everyday” outfit go from “eh” to “I actually feel a little bit trendy”! Isn’t that funny? bahhhaa, love the last pic! Hi! Love your outfits! 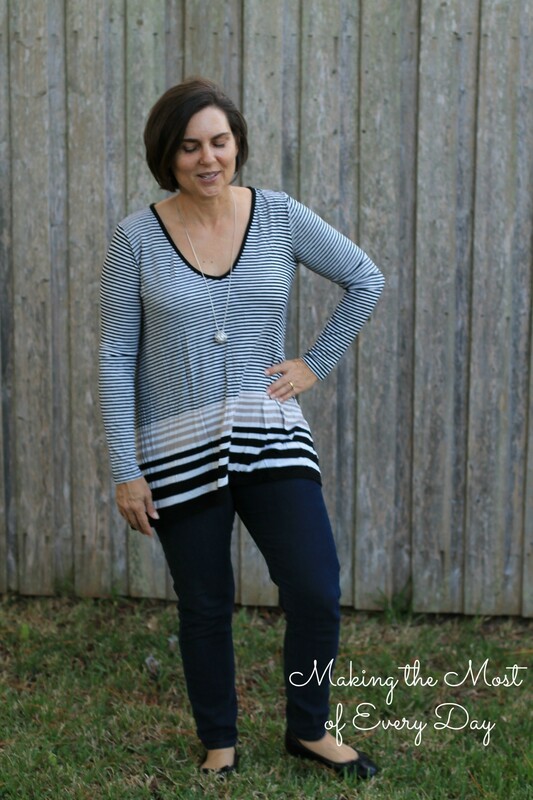 Where do you find your tunic/swing tops? those are so amazing! I have had success finding them at Marshall’s and TJ Maxx. Thanks for stopping by!